Dr. Lesslie was a Radiology Resident at the University of Texas Health Science Center Medical School at the time of this submission and is currently a radiologist with Greater Houston Radiology Associates. Dr. Chasen is a Professor, the Department Chairman ad interim of the Department of Radiology, Division of Diagnostic Imaging, The University of Texas M.D. Anderson Cancer Center. Dr. Munden is a Professor, the Associate Division Head of Translational and Clinical Research, and the Section Chief of Thoracic Imaging, Division of Diagnostic Imaging, The University of Texas M.D. Anderson Cancer Center, Houston, TX. 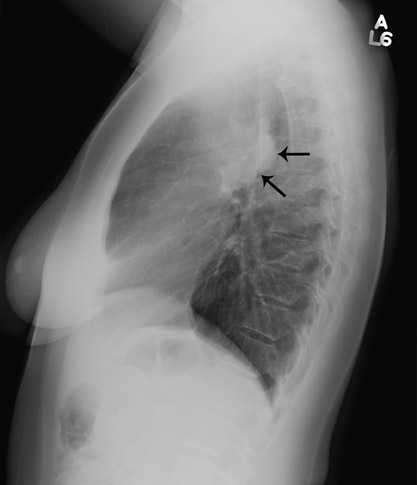 The diagnostic evaluation of mediastinal disease requires a thorough understanding of mediastinal anatomy on chest radiography and cross-sectional imaging. 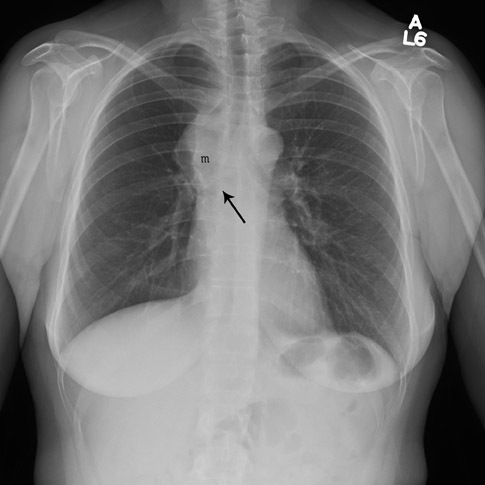 Localizing and understanding the relationship of an abnormality to a mediastinal compartment or normal structure can provide a valuable clue for the diagnosis of a mediastinal mass. 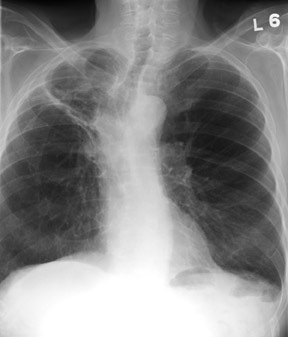 The chest radiograph is the most often performed radiographic examination, constituting more than 40% of the total volume of radiographs, with >50 million chest radiographs performed per year in the United States. 1 Therefore, it is important for radiologists to understand the appearance of normal structures and how they can be altered by disease. 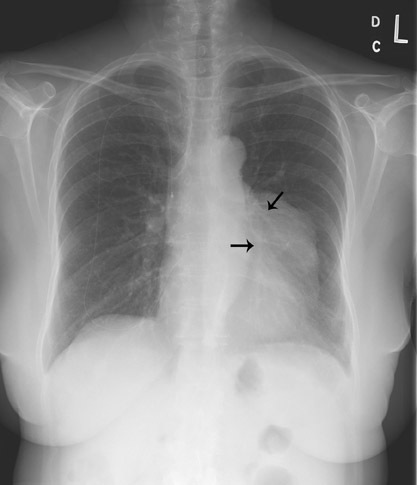 In particular, the detection of mediastinal disease can be difficult with conventional chest radiographs, as many masses are of soft tissue density and are surrounded by structures composed of soft tissue. 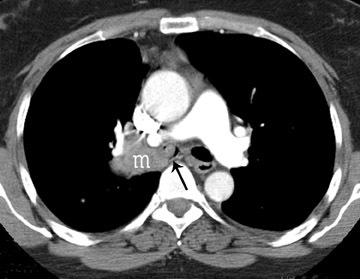 To facilitate the detection and classification of mediastinal lesions, most radiologists divide the mediastinum into 3 compartments, as proposed by Felson 2 (Figure 1). The anterior mediastinum is bounded anteriorly by the sternum and posteriorly by a line drawn from the anterior aspect of the trachea and along the posterior heart border. The posterior mediastinum is defined by a line that is 1 cm posterior to the anterior edge of the vertebral bodies. The middle mediastinal compartment lies between the anterior and posterior mediastinum. 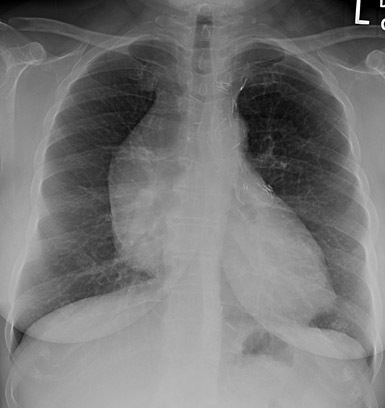 This division of mediastinal compartments is also used in cross-sectional imaging. 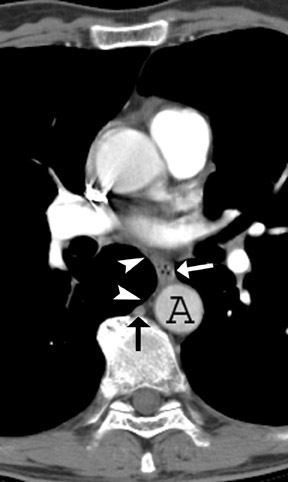 Normal anatomic structures of the mediastinum may be altered by mediastinal disease. 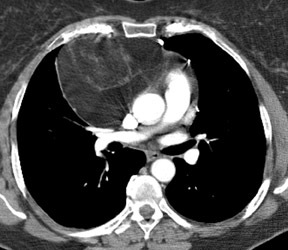 This alteration of normal anatomy may alert the radiologist to the presence of a mediastinal mass. 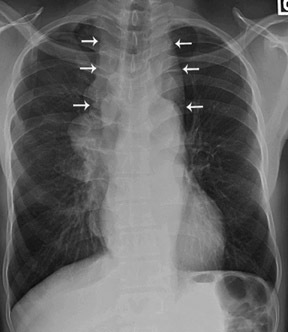 Thus, familiarity with the appearance of normal mediastinal structures on chest radiography is a crucial part of identifying an abnormality (Figure 2). The anterior and posterior junction lines are normal mediastinal structures that are not evident in all patients. However, when present, these lines can be helpful in determining an abnormality. The close apposition of the lungs and pleura anterior to the ascending aorta and right ventricular outflow tract forms the anterior junction line, which courses obliquely from the upper right to lower left behind the retromanubrial region toward the heart. 3 Similarly, the posterior junction line is formed by the close apposition of the lungs and pleura posterior to the esophagus and anterior to the spine, coursing vertically from the lung apices to the top of the aortic arch. 4 These lines should be smooth and concave. 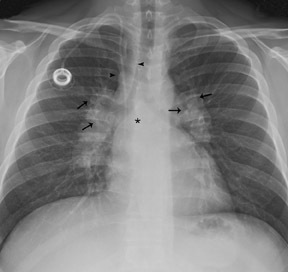 Although no abnormality may be assumed in the absence of these landmarks, when either is displaced or bulging, it is an indicator of a possible mediastinal abnormality. 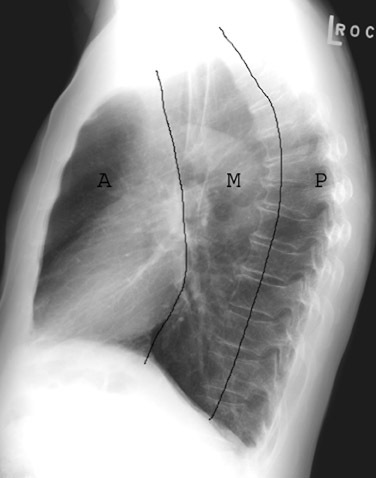 The right paratracheal stripe appears as a thin, soft tissue density structure located between the tracheal air column and the adjacent right lung. 5 This can be followed as it passes vertically from the undersurface of the clavicles to the azygos arch. It should be smooth and range in width from 1 to 4 mm. 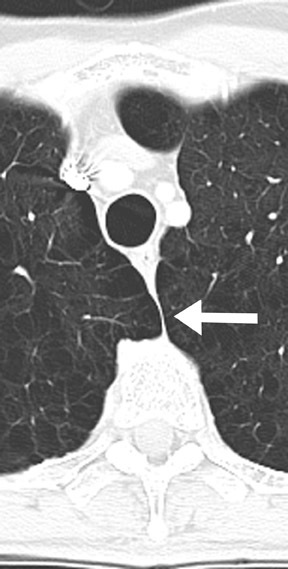 The azygoesophageal recess is an interface formed by the apposition of the right lung and pleura and the right lateral margin of the azygos vein and esophagus. This descends vertically from the undersurface of the azygos arch to the diaphragm, with a gentle convexity curving toward the left. The interface should be smooth without focal bulges or extreme deviation from the midline. The left paraspinal interface is formed where the left lung and pleura abut the left lateral margin of the vertebral bodies and paravertebral soft tissues. Although not always seen in its entirety, it should be smooth as it courses vertically from the level of the aortic knob to the diaphragm and have a uniform distance from the lateral margin of the spine. 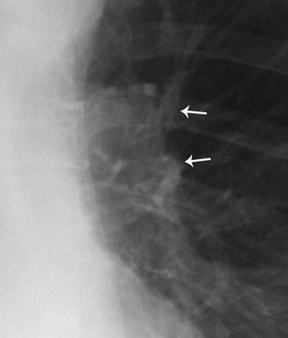 In addition to altering normal structures, the presence of mediastinal malignancies can result in radiographic signs or patterns that aid in detection and localization. Many of these classic signs and patterns were originally described by Felson 6 and continue to be beneficial in interpreting chest radiographs. 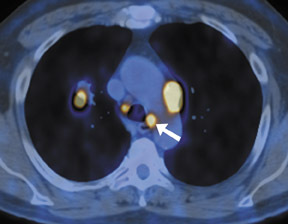 When a mass abuts a normal mediastinal structure of similar radiodensity, the margins of the 2 structures will be obliterated. This sign is referred to as the "silhouette sign," although there is actually desilhouetting of the normal structure by the mass. 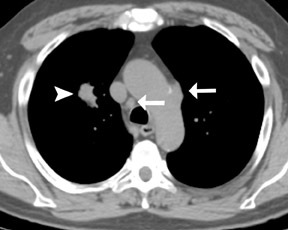 This apparent loss of the margin of the normal structure can be used to localize a mediastinal mass to the same compartment as the normal structure. 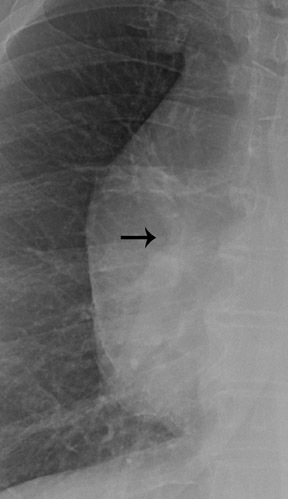 The hilar overlay sign (Figure 3) is another sign described by Felson 6 that is especially useful in distinguishing an anterior mediastinal mass from a prominent cardiac silhouette. If the bifurcation of the main pulmonary artery is >1 cm medial to the lateral border of the cardiac silhouette, it is strongly suggestive of a mediastinal mass. If the pulmonary artery arises from the lateral heart border, this favors an enlarged heart. In other words, because the pulmonary arteries arise from the heart, when the heart enlarges, then pulmonary arteries must move laterally with the heart border. 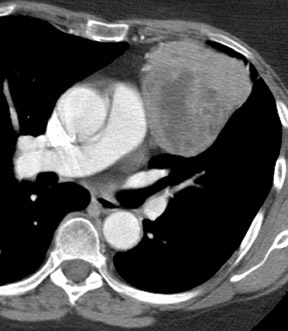 An anterior mediastinal mass that appears as an enlarged cardiac silhouette will not cause displacement of the pulmonary arteries. 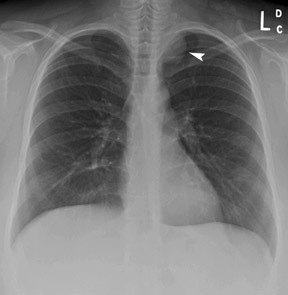 The hilar convergence sign is used to distinguish between a prominent hilum and an enlarged pulmonary artery. 6 If the pulmonary arteries converge into the lateral border of a hilar mass, the mass represents an enlarged pulmonary artery (Figure 4). If the convergence appears behind the abnormality or arises from the heart, a mediastinal mass is more likely. In other words, because the pulmonary artery branches arise from the main pulmonary artery trunk, an enlarged pulmonary artery will have branches that arise from its outer margin (the vessels converge toward the main pulmonary artery). 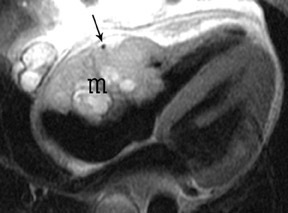 A hilar mass may have the appearance of an enlarged pulmonary artery, but the vessels will not arise from the margin; instead they will seem to pass through the margins as they converge on the true artery (Figure 5). Mediastinal germ cell tumors are thought to originate from primitive germ cells misplaced in the mediastinum during early embryogenesis. 14 The most common extragonadal primary site is the anterior mediastinum, especially the anterosuperior portion. 15,16 Teratomas are the most common mediastinal germ cell tumors. 15,16 Mature teratomas, which represent approximately 60% to 70% of mediastinal germ cell tumors, are usually well-differentiated and benign. 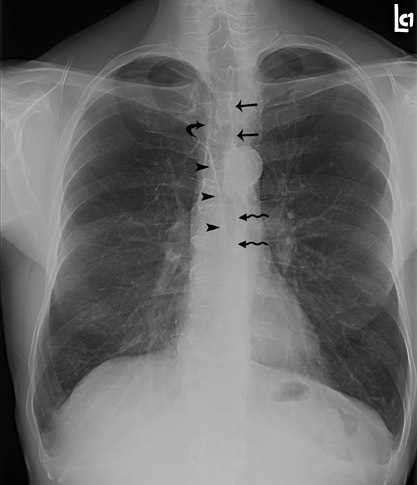 16 On chest radiography, these are rounded to lobulated, well-defined anterior mediastinal masses that may extend to one side of the midline and may attain large sizes. 17 Calcification and, rarely, identifiable bone or teeth, may be evident. 17 CT reveals a heterogeneous, predominantly cystic mass with well-defined margins. An anterior mediastinal mass with foci of fluid, soft tissue, calcium, and/or fat attenuation is highly specific for a mature teratoma. 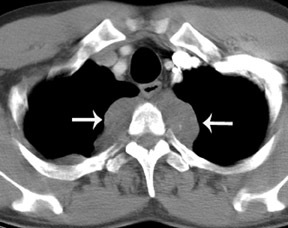 Most lesions of the thyroid are goiters or cysts, and it is not uncommon for them to be detected on CT. Thyroid lesions are reported to extend into the mediastinum in 1% to 3% of patients at the time of thyroidectomy. 18 The most important feature to distinguish mediastinal thyroid from other disease is continuity between the cervical and mediastinal components. While most thyroid lesions extending into the mediastinum are goiters, radiologists must be aware that malignant lesions can also present in this manner. The most common histologies of thyroid carcinomas are papillary, follicular, medullary, anaplastic, and Hürthle cell. 19 Of these, medullary carcinoma is the most likely to metastasize to the mediastinum, while the others tend to spread to the lungs. 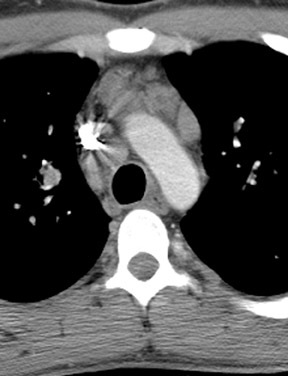 CT complements nuclear medicine imaging of thyroid malignancies by showing anatomical definition of a primary tumor, extent of mediastinal involvement, and pulmonary metastases. 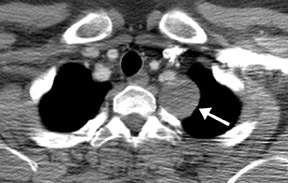 Because of the high iodine content of thyroid tissue, unenhanced CT imaging of the thyroid may reveal foci of high attenuation. There may also be areas of low attenuation due to hemorrhage and cyst formation, and calcifications may be present. Intravenous contrast is usually not administered because of interference with radioactive iodine nuclear medicine studies. However, if contrast is administered, intense and prolonged enhancement may occur. Radioactive Iodine-123 and -131 scintigraphy may be confirmatory when radioactive uptake from functioning thyroid tissue is exhibited. Lymphoma is another malignancy that is well known to affect the anterior mediastinum, although it may be present in any of the 3 mediastinal compartments. This entity will be discussed within the next section. Most middle mediastinal tumors are mainly lymphatic in origin, including lymphoma and metastatic tumors, especially in the lung and breast. Also, esophageal cancer can occur as a primary malignancy of the middle mediastinum (Figure 9). 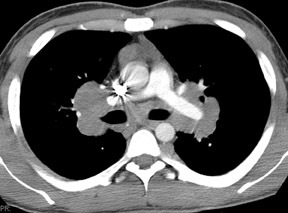 However, both lymphoma and metastatic disease may be found in any of the mediastinal compartments. Esophageal carcinomas most commonly involve the distal esophagus and are of adenocarcinoma histology, usually in the setting of pre-existing Barrett's esophagus. These aggressive malignancies are often associated with a dismal prognosis, with surgery alone resulting in a survival rate of only 6% to 40% at 9 to 24 months. 37 Multimodality therapy has been shown to improve survival in a certain subset of patients 37 ; therefore, accurate staging is essential to guide treatment planning and identify patients who may benefit from multimodality therapy. Traditional noninvasive staging modalities include CT, endoscopic ultrasonography (EUS), and FDG-PET. Endoscopic ultrasonography is useful for the evaluation of the depth of primary tumor penetration within the wall and invasion of periesophageal tissues. Endoscopic ultrasonography has a reported accuracy for determining T and N staging of 85% and 75%, respectively, and a sensitivity ranging from 85% to 95% and 70% to 80%, respectively. 38 However, staging by EUS is not possible in all patients with esophageal cancer because of esophageal stenosis or obstruction by tumor. Endoscopic ultrasonography is also limited for staging distant metastases. In addition to evaluation of the primary tumor, compared with EUS, CT has an additional benefit in the evaluation of mediastinal invasion, spread to lymph nodes, and distant metastases. Metastatic disease typically involves distant lymph nodes (usually abdominal), liver, and lung. Assessment of the primary tumor with CT is limited without contrast distension of the esophagus, but may be useful in assessing response to therapy. 37 It has been shown that FDG-PET is more effective than CT in detecting distant metastases. 38 This is an important advantage, as the identification of patients with distant metastatic disease avoids unnecessary surgery and ineffective radical therapies that may be associated with high morbidity in patients with incurable disease. In fact, the recognition of local or distant metastases with FDG-PET has been shown to be highly predictive of survival. 37 Recently, FDG-PET has also been shown to be an accurate test to predict long-term survival after preoperative chemoradiation therapy (CRT), with a post-CRT FDG-PET standard uptake value (SUV) of ≥4 associated with a significantly worse 2-year survival rate than those with an SUV of <4. 37 This could assist in customizing therapeutic regimens that minimize futile treatment associated with high morbidity while maximizing therapeutic benefit. Integrated PET/CT represents an exciting advance in FDG-PET imaging, as it offers improved anatomic resolution of FDG-avid lesions. Integrated PET/CT has been shown to be more accurate than either PET or CT alone in tumor staging in NSCLC 7,43 (Figure 10). In a recent study comparing PET, CT, and fused PET/CT, the reported accuracy for detecting metastatic mediastinal lymph nodes was 63% for CT alone, 89% for PET alone, and 93% for PET/CT. Sensitivity and specificity for PET/CT was 89% and 94%, for PET 89% and 89%, and CT 70% and 59%. 7 Similar results have been reported for the use of PET/CT in the staging and restaging of lymphoma. A recent study by Schaefer et al 29 was performed comparing fused PET/CT with contrast-enhanced CT in 60 patients with HD or NHL. The sensitivity of PET/CT and contrast-enhanced CT was 94% and 88%, and the specificity was 100% and 88%, respectively. The promising technology of fused PET/CT in lung carcinoma, esophageal carcinoma, and lymphoma will lead to further utilization in other mediastinal diseases. Neurogenic tumors constitute the majority of posterior mediastinal mass lesions 23 (Figure 11). Neurogenic tumors are generally categorized as arising from either peripheral nerves or sympathetic ganglia. Schwannoma, neurofibroma, and malignant tumor of nerve sheath origin arise from peripheral nerves. Ganglioneuroma, ganglioneuroblastoma, and neuroblastoma arise from sympathetic ganglia. Mediastinal tumors constitute a wide variety of lesions because of the diverse anatomic structures within the mediastinum. It is important for radiologists to understand normal mediastinal structures, mediastinal compartments, and common mediastinal malignancies in order to detect and characterize mediastinal masses. 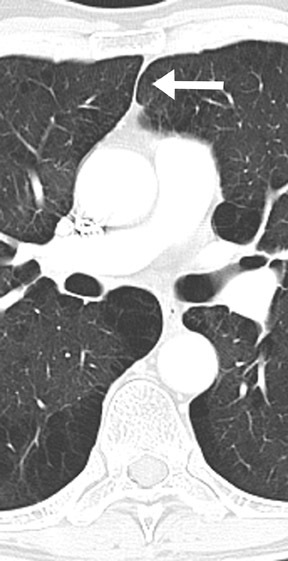 Imaging of the mediastinum in oncology. Appl Radiol.